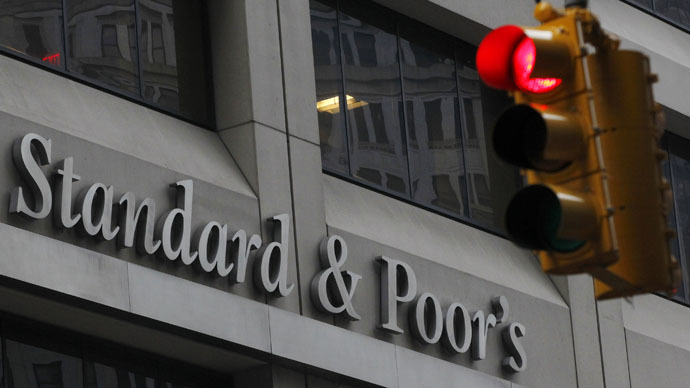 The ratings agency Standard & Poor’s will have to pay over $77 million and is to be barred for one year from grading certain bond deals for loosening its rating criteria in order to win business. Investors had not been informed of these changes. This comes after a settlement with US federal and state regulators over “fraudulent misconduct” and is the first time that the Securities and Exchange Commission (SEC) has ever fined one of the big three credit-raters, since it won authority from Congress in 2006 to look after the sector, Reuters reported. The SEC says that S&P will have to pay $58 million to settle three matters with the agency, while they will have to fork out another $19 million to settle cases with the attorneys general of New York and Massachusetts. “Investors rely on credit rating agencies like Standard & Poor’s to play it straight when rating complex securities,” said Andrew Ceresney, the SEC's enforcement director. “But Standard & Poor’s elevated its own financial interests above investors by loosening its rating criteria to obtain business and then obscuring these changes from investors,” he added, according to Reuters. Most of the allegations against the ratings company stem from problems that arose in 2011 over its ratings of certain commercial mortgage-backed securities. Meanwhile S&P is still negotiating with the US Justice Department over a claim filed against the rating agency in 2013 for passing off junk securities as high-level assets ahead of the 2008 financial crisis. The agency may have to pay compensation of up to $1 billion, Bloomberg reported on January 13. The Central Bank of Russia announced on Monday it will no longer use credit ratings from Standard & Poor’s, Fitch, or Moody’s that were assigned after March 1, 2014. All credit ratings given to Russian companies and banks will now be at the discretion of the Board of Directors of the Bank, according to a press statement. The regulator will assess whether or not the ratings made after March are accurate.